Save Up to 91% on Huggies Diapers or Wipes! You are here: Home / Great Deals / Amazon Deals / Save Up to 91% on Huggies Diapers or Wipes! but allows extra savings of 20% off (with Subscribe and Save) on things like diapers and wipes. This means with sales, coupons, subscribe and Save and the extra 50% off, you can save over 90% on some of the diaper and wipe packs. 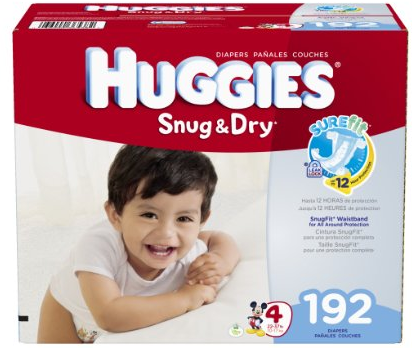 For instance, this pack of Huggies Snug n Dry (Size 4) Diapers (192 Count) is only $10.16 with these promotions! Make sure you select Subscribe & Save as you delivery option. Head to the checkout. All your discounts and coupons will be applied there! Plus, you get FREE 2 day shipping! who signed up between August 5 and August 17, 2014. You have until September 17th to place your first order and get the discount, so hurry! Prices can change on Amazon so make sure that if you want to take advantage of this particular deal, you order now. For more info on Amazon Prime, Click here.